A Wal-Mart store in Ohio is collecting food for its workers. One Wal-Mart store in Ohio is collecting canned food to help its workers feed their families a Thanksgiving dinner. 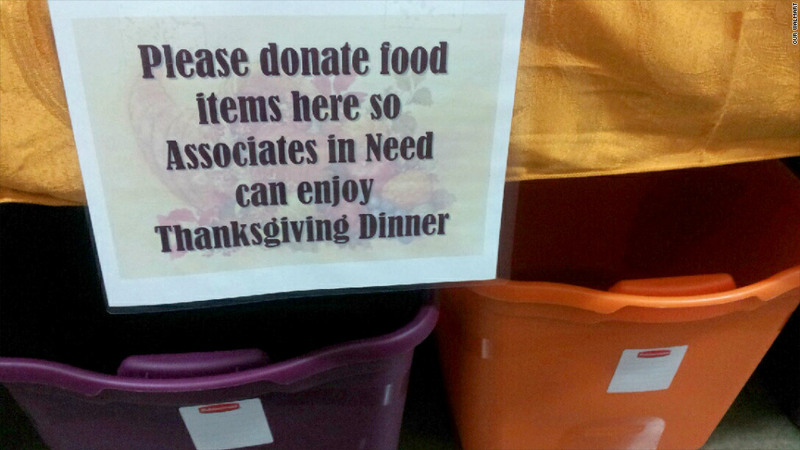 "Please donate food items here so associates in need can enjoy Thanksgiving dinner," a sign above two bins located near the store's backroom reads, according to photos circulated by the union-backed group OUR Walmart. The group has been organizing Wal-Mart (WMT)worker protests since last year. Wal-Mart spokesman Kory Lundberg said that particular store has held similar food donation drives for several years. The food supports workers who are facing "an unforeseen hardship," such as a spouse losing a job. Some of the food collected last year went to a mother whose child support benefits had stopped, so it helped provide her children a holiday meal, he said. "I spoke to workers at the store today and they said that they're going to continue to look after their folks who have realized a hardship recently," Lundberg said. He wasn't aware of similar drives at any of its 4,000-plus stores nationwide, but he said he wouldn't be surprised if they were. The food drive plays into claims that Wal-Mart does not pay its workers a living wage. In September, Bill Simon, president and chief executive officer of Wal-Mart U.S., said that less than half of the company's U.S. employees make more than $25,000 per year. The federal poverty level for a family of four is $23, 500. A few months earlier, a report released by Congressional Democrats showed that the cost of these low wages are transferred to taxpayers, since employees then rely on public assistance programs. The report, put out by the Democratic staff of the House Committee on Education and the Workforce, estimated that one Wal-Mart supercenter alone employing 300 workers could cost taxpayers at least $904,000 annually. Low wages have sparked a spate of protests over the last year, wherein Wal-Mart workers have called for better pay, more hours and the right to speak out without retaliation. The protests kicked off last year around Black Friday. Earlier this month, three current and two former Wal-Mart workers were arrested while picketing outside of a Los Angeles store. The particular focus on Wal-Mart's Thanksgiving drive comes just weeks before one million workers are expected to work over the holiday weekend. The stores will open earlier than ever before, beginning at 6 p.m. on Thanksgiving. The retailer said it would give workers a holiday meal, extra pay and 25% off of an entire purchase in order to combat the backlash that retailers were ruining Thanksgiving for their employees. Wal-Mart also held a series of town halls across the country on Monday, where they surprised 350 workers with promotions. The company said it's on track to promote 160,000 workers this year, including more than 25,000 between November and the end of January. But OUR Walmart said that's not enough. Organizers held a call Monday afternoon announcing it's mobilizing workers and community groups to protest once again on Black Friday.